Rabia (Rah-bee-ah) is 8 years old and had not walked for 5 years due to some kind of ill­ness that affected both her legs. Severely mal­nour­ished and very frail, both her lower legs were cov­ered with open, infected ulcers. Rabia and her grand­mother came to our church last week for the first time. We prayed for her com­plete heal­ing and com­manded life back into her legs. I treated her ulcers with Melaleuca oil (which has 5 times the heal­ing power of the Alav­era cac­tus) and gave her antibi­otics as well as a week’s worth of the high pro­tein cereal, Hypo Pop, for mal­nour­ished children. TODAY, RABIA SHOCKED ALL OF US BY WALKING TO THE CHURCH AND SHOWING EVERYONE THAT JESUS HAD HEALED HER!!!!! It was amaz­ing to see her WALKING on legs that were no more than tooth­picks with skin cov­er­ing them. The smile on her face said much more than words ever could. Her grand­mother said that 5 days after we prayed for her, she just got up and started walk­ing. Before this, Rabia had to be car­ried everywhere. I spent over an hour treat­ing the sick after church today, as many are com­ing to seek prayer and med­ical help from the “back­pack clinic” that I hold right after the Namara church ser­vice. A teenage boy brought his lit­tle 4 year old brother because his mother had neglected the lit­tle boys’ severely injured foot for 7 days. A metal rod had punc­tured the top of his left foot, caus­ing an open wound that was badly infected. How the lit­tle one tol­er­ated the pain, was amaz­ing to me. The mother couldn’t be found, so the aunt agreed to come with us so the child could be attended at the Balama hos­pi­tal. The lit­tle one needs 7 days of Peni­cillin injec­tions and fre­quent ban­dage changes, so he will be liv­ing with his friend Veron­ica (the woman who was healed of the severely burnt foot). These 2 fam­i­lies know each other well, and Veron­ica was glad to have them stay with her while the lit­tle one gets the proper treatment. My Christ­mas Wish List includes med­i­cines for my “BACKPACK CLINIC”. This clinic is sav­ing many lives each week with med­i­cines that costs pen­nies per treat­ment. A child’s life can be saved for ONE DOLLAR. That is all it cost to treat a child with an infected wound, diarhea, res­pi­ra­tory infec­tion, or an ear ache. 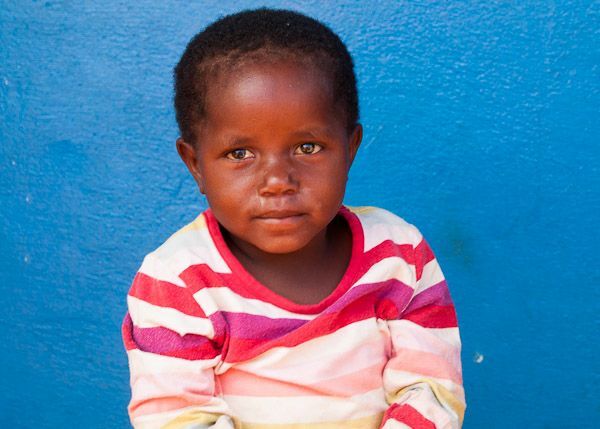 $60 buys 1000 tablets of antibi­otics that can save the lives of 65 children. FIVE HOUSES received the Rocket Stoves last week and more will be built this week. As you read this, Engi­neer Michael Lowe, will be land­ing in Atlanta, after work­ing with our brick lay­ers for the last 3 weeks to deter­mine the best stoves for our needs. He built 2 dif­fer­ent types: large stove for the huge pots needed for large groups, and the smaller house­hold stove for families. Rocket stoves use less fire­wood and put out very lit­tle smoke in com­par­i­son to nor­mal open fire cook­ing (which is all we could do before learn­ing to build the Rocket Stoves). The moth­ers LOVE THE STOVES as the food cooks so much faster, mak­ing it eas­ier to pre­pare and eat a meal with­out hav­ing to wait 2 hours for the beans to cook. THANK YOU MICHAEL LOWE FOR YOUR HELPING HAND IN BRINGING EFFICIENT COOKING TO OUR WIDOW’S HOMES. We’d also like to thank our Texas donor who blessed Michael with the funds for this trip. God used Michael in many ways. He told me before he left that he really learned a lot from us too. It was a great learn­ing expe­ri­ence for all of us. Food Dis­tri­b­u­tions are now com­pleted for 2012 and it has rained 2 days this last week. We are hus­tling to com­plete all the con­struc­tion as oil paint doesn’t dry well in damp weather. More to come next week, so stay tuned to the Bush Bunny Blog for fur­ther development. FYI: due to a slightly faster inter­net ser­vice now in our area, I can now down­load Face­book. I have reac­ti­vated my per­sonal page, so look me up if you want to be friends. Search for bren­da­sue­lange and you will find me. PRAY FOR SAMANTHA BARNHART, as she will fly out this Wed. and be back in But­ler, PA by Fri­day. SAM has been an awe­some helper over the last 90 days as she assisted in the Sept. corn buy­ing as well as coor­di­nated the load­ing of all the truck loads of food that was dis­trib­uted in the last 3 months. Sam assisted Leona with the woman’s pro­grams, and helped with many children’s and sports evan­ge­lism pro­grams. We wish her well, and hope God will call her back to us very soon. P.S. Per­sonal thanks and bless­ings to all our read­ers who have sent get well mes­sages and prayer sup­port for me while I have been mend­ing from my alter­ca­tion with the rogue vac­uum cleaner. The road to heal­ing con­tin­ues and God is faith­ful teach­ing us new things daily. Con­tin­ued prayers are appreciated. Sat­ur­day at 9a.m. a pick-up truck drove through our gates with 5 gov­ern­ment offi­cials who dropped in to sur­prise us with an inspec­tion of our min­istry and children’s homes. But the sur­prise was theirs when they say the new girl’s and boys’ dorms that is being painted and almost ready for the chil­dren to live in. Michael Lowe, from Engi­neers with­out Bor­ders, was busy super­vis­ing one of our mas­ter brick­lay­ers, who was build­ing one of the new ROCKET STOVES that uses very lit­tle fire­wood. The inspec­tors were totally fas­ci­nated with the Rocket Stoves as the lead inspec­tor had heard of these stoves but had never seen one. These 5 men and women were so pleased with what they saw at Bal­bi­nas, plus the newly con­structed houses, that they said they did not need to see any more. They told us to keep up the pos­i­tive work we were doing, and they left, as they had many other children’s pro­grams to inspect. We were truly THRILLED at get­ting such a pos­i­tive report from them! 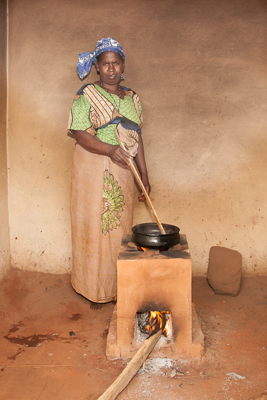 Michael’s stoves ARE TRULY WONDERFUL and the women who are cook­ing on the ones we just built are super happy! They get more heat from less fire­wood, mean­ing that water boils faster, and the food cooks quicker. Zito’s mother will receive the first Rocket Stove in Namara tomor­row when our truck takes Michael and his stove build­ing team to that vil­lage. 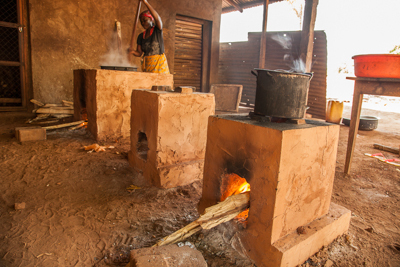 We’ve invited sev­eral brick lay­ers to attend and learn how to build the stoves TOTALLY from local mate­ri­als that they have. Our objec­tive is to train up sev­eral men in that area that can build stoves for the many wid­ows of the Namara Church. Last week we deliv­ered food twice to the orphans and their grand­moth­ers (mostly tod­dler age orphans) in the Kwe Kwe area. This gives them seed to plant and food to eat dur­ing the rainy sea­son. This Fri­day, we will make the last food drop for this year to the orphans in the 7 vil­lages of the Mavala area (Mango Tree Church area). That will close our 2012 food pro­gram for the remote areas, as the rainy sea­son is about to begin. For those of you not famil­iar with our area, our roads are clay and sand. Once the rains begin, many roads become too muddy for even 4 wheel drive to nego­ti­ate. Many of the remote vil­lages we serve are only acces­si­ble by foot or bicy­cle from Jan­u­ary to March. Not even motor­bikes can get through this sticky mud. That’s about it from this side for this week. Happy Thanks­giv­ing to every­one in the USA. Enjoy your Turkey Day! We hope to find a big fat chicken that wants to be our guest of honor. With temps at 95 to 98 F (36 C) most of the day and EVERY CREATURE look­ing for water, this country’s water wells are packed with peo­ple. Our water well team repaired 2 vil­lage wells this week within a few hours of being noti­fied, because even 1 day with­out water makes peo­ple des­per­ate. That means the kids will drink any sur­face water they can find, lead­ing to deadly dysen­tery or cholera. Mpaca’s (M-pah-ka) well was out for sev­eral days, when Pas­tor Pinto out of des­per­a­tion, (his wife was seri­ously threat­en­ing to take the kids and go back to their home vil­lage where water existed), rode his bicy­cle 17 miles in this intense heat, to beg us to come fix it. There are sev­eral wells in that area, but over 5,000 peo­ple needed water, and women were hav­ing fist fights over the 8 to 12 hour wait­ing period. He said the 5 gal­lon con­tain­ers wait­ing to be filled cov­ered an area 50 yards/meters square at each well! Pump­ing 24 hours couldn’t fill the need. Our team was out there the next day. The well was down because $30 worth of plas­tic and rub­ber parts had worn out. On Thurs­day, my dri­ver picked up our painters after they com­pleted paint­ing the Namara church walls to pro­tect them from rain. As they passed the Pequaria church, they were stopped and told that the village’s ONLY water well had bro­ken that morn­ing. They begged us to fix it. Within 2 hours our team was there and the same $30 worth of parts was all it needed to fix it. SO LITTLE CAN MEAN THE DIFFERENCE BETWEEN LIFE AND DEATH FOR 1000’S OF PEOPLE. The 2 pro­to­types have been built and we will fire them up tomor­row (had to let the mor­tar dry). The women have seen it and are excited as they are will­ing to try any­thing to cut down on their use of fire­wood. Michael is enjoy­ing get­ting to know the local cul­ture and the peo­ple. GOD OPENS THE DOOR FOR MASSIVE HEALTH TEACHINGS VIA RADIO! IMPACT WILL AFFECT 128,000 PEOPLE!!!! The Balama radio sta­tion man­ager came to us in des­per­a­tion this week, beg­ging for help with his com­mu­nity ser­vice pro­grams. His spon­sors had slowly melted away this year, until he was left with NO funds to help the peo­ple learn to live health­ier lives. The men and women work­ing to put these radio pro­grams together, AND han­dle the daily radio broad­cast­ing only receive $7/MONTH as their reward for over 80 hours of work. They truly have a heart to help the public. This is a great OPEN DOOR for us, as it gives us the oppor­tu­nity to impact 128,000 peo­ple with our health teach­ings on Absti­nence against the spread of AIDS, pre­vent­ing malaria, cholera, dysen­tery, TB, and many other health prob­lems that plague these com­mu­ni­ties. We’ll be able to impact them with Bib­li­cal morals, etc. as well as teach them through Chris­t­ian music. COMMUNITY HEALTH: (30 minute pro­gram) how to avoid and what to do when you get sick with the main killer dis­eases of our area (malaria, cholera, dysen­tery, AIDS, etc). WOMEN’S PROGRAMS (15 min) on bet­ter BABY CARE and how to raise healthy chil­dren, nutri­tion, etc. Eric and our Pro­gram Direc­tor, Nilza, who is spe­cially trained in Social Ser­vice work, will be com­bin­ing forces with the local radio sta­tion vol­un­teers to get these pro­grams orga­nized and ready to record in Jan­u­ary. CHRISTIAN MUSIC will be used to high­light the pro­grams. These vil­lagers are crazy about our music, so this will be used as a draw­ing card to get peo­ple to learn what they need to know. WE NEED SPONSORS FOR THESE PROGRAMS that will air WEEKLY for a total of 80 minutes/week start­ing in Janaury. Nov. and Dec. has been donated, as the radio sta­tion has pro­grams that are ready to air. This is a gift that will impact the mul­ti­tudes as EVERY VILLAGE has peo­ple with “boom boxes” who blast these pro­grams for all to hear. If God leads you to help us with this pro­gram, please put RADIO in your check memo so we know how to use your gift. NINETY FIVE Stu­dents from 3 bush Bible School exten­sion pro­grams con­verged on Balama Fri­day to receive their final words of wis­dom (and a great goat feast) before being sent out to evan­ge­lize their neigh­bors in very remote areas of Balama county. Pas­tor Alberto Pes­sute and I are part of the Inter­na­tional Vic­tory Bible Insti­tute pro­gram. Vic­tory Chris­t­ian Cen­ter in Tulsa, OK pro­vides us the teach­ing mate­ri­als in Por­tuguese. Pas­tor Alberto trans­lates it into Makua for his teach­ings in the remote areas as the peo­ple do not speak Por­tuguese. God’s Word is being planted and mul­ti­plies among the lost as we train up lead­ers to help har­vest God’s End Time Believ­ers. YOUR LOVE GIFTS ARE REAPING A TREMENDOUS HARVEST! Bless­ings to all of you, as we con­tinue to hand out food to the orphans before the rainy sea­son iso­lates them in their remote vil­lages. Bush Bunny Brenda and the Balama Team. I imme­di­ately called our Dis­trict Social Ser­vices offi­cer, but he was in Pemba (4 hours away). He instructed me to get our lead­ers and go to the police if she wouldn’t return the child. Capena, Head Admin­is­tra­tor for O.U, in Balama, and Nilza, our res­i­dent Social Ser­vice worker, met me at my house. We decided to “trade her” for what she really wanted. (The food she never picked up that morn­ing.) She has said many times she has no use for Dominica, so we knew she didn’t really want the child. We fixed up the food she was sup­posed to receive that morn­ing and went look­ing for her. PTL that she headed to her mud hut in a vil­lage about 3 miles from us, and our team located her near her home. She will­ingly gave up Dominica in exchange for the food, and was told that if she does this again, she will go to jail. (The Police is the only thing she is really scared of). In Moz., the laws pro­tect the men­tally dis­turbed. Unless she phys­i­cally harms some­one, the police can do noth­ing to this woman. So although this looks like it was not the right thing to do (giv­ing her what she wanted), the impor­tant thing is that Dominica was returned unharmed. This was very trau­matic for Dominica, as she sees Bal­bina as her true mother. She pos­si­bly has some mem­ory of the bad times in her early life with her birth mother, so right now we are con­cen­trat­ing on mak­ing her feel secure. We also real­ize that if this woman fails to pick up her food in future, we need to take spe­cial pre­cau­tions to pre­vent a repeat of this incident. Nor­mally, Octo­ber and Novem­ber are SUPER HOT AND DRY—98–102 degrees F (38–40 C) with no rains till end of Novem­ber. But Antarc­tica has been send­ing us some unique cold fronts this year, caus­ing many kids to have colds and upper res­pi­ra­tory infec­tions. Remem­ber, these kids have only thin cot­ton cloth­ing, and most don’t own a long sleeve shirt, much less a jacket. Thurs­day and Fri­day it RAINED many hours with strong, bit­terly cold winds com­ing from the south. I spent the day in a sweat suit! With the unex­pected rains, our teams had to scram­ble as the Nac­caca church is not roofed yet, and the Namara church needed it’s con­crete foot­ing and oil paint to pro­tect it from blow­ing rain. 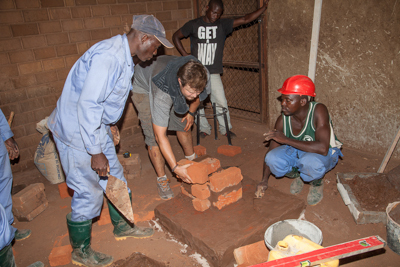 Our 18 man brick lay­ing team went out yes­ter­day and in 6 hours com­pleted all the work on the Namara church. Our teams will work hard this week to dig the holes needed so the roof can be built over the Nac­caca church. With Jesus return­ing soon, the only “norm” we can expect is that “NOTHING WILL BE AS IT WAS IN THE PAST”. So expect the unex­pected and you won’t be caught off guard. ENGINEERS WITHOUT BORDERS rep­re­sen­ta­tive, Michael Lowe, of North Car­olina arrived yes­ter­day. After church today, I took Michael to 3 of our homes so he could “get a visual” on what is needed. He will be assist­ing us in plan­ning and build­ing 2 types of very effi­cient wood burn­ing stoves that use only small amounts of fire­wood, even twigs if that is all you have. I’ll keep you updated on how this goes and we’ll send pho­tos of the end result. Michael has 3 weeks to orga­nize, build, and train our team to dupli­cate what works best with our local materials. In Mozam­bique, if you want a church in the bush, the mem­bers have to build it. Pas­tor Alberto just returned a few min­utes ago with a heavy heart. He went to preach God’s Word at Ntele, a very remote vil­lage with over 40 adults and 80+ chil­dren attend­ing our newest “under the tree” church each Sun­day. The rainy sea­son is only 2 weeks away, so the mem­bers are in a rush to com­plete their church. It only lacks the roof. Late yes­ter­day after­noon, a group of church men were out cut­ting bam­boo poles for the roof. The grass and bam­boos were sway­ing in the heavy winds. It was hard to hear and dif­fi­cult to see with all the dust fly­ing. Unknown to these men, a black mamba, the fastest snake in the world, was stalk­ing the area. The snake struck one of the men before any­one saw it. That man only had min­utes to say his good­byes before his tongue was par­a­lyzed by the fast act­ing venom. He met Jesus a few min­utes later. Alberto encoun­tered the church mem­bers dig­ging his grave when he arrived. Alberto preached the funeral, as the whole vil­lage looked on. This man did not die in vain, as many from his vil­lage heard the gospel today who might not have ever heard it oth­er­wise. His earthly body lays near the church he helped build, while he’s enjoy­ing a NEW BODY with Christ Jesus in heaven.